This was a pilot roundtable initiated as part of a wider research collaboration by BP’s Director of International University Relations, Anna-Marie Greenaway and sponsored by Head of Emerging Technology, Dr Dan Walker. 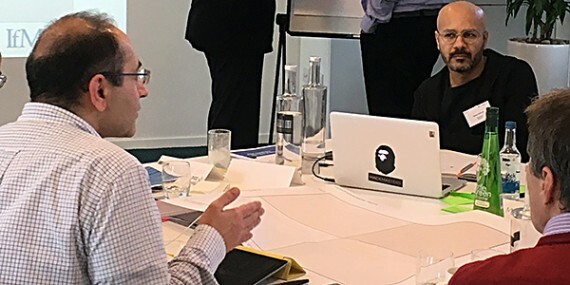 The inaugural workshop explored the future of mobility for both people and freight and was coordinated by the IfM’s Education and Consultancy Services (IfM ECS), senior industrial fellow, Dr Nicky Athanassopoulou, together with Gill Ringland, CEO of SAMI Consulting. Dr Athanassopoulou said integrating two different methodologies in the workshop – scenario planning and road-mapping – provided a coordinated way to analyse future scenarios, derive new insights and elicit the emerging technologies that would play a critical role in the future: “We began the workshop using the Three Horizons framework to capture the drivers of change in mobility. This provided a practical framework to bring together different ideas. The attendees included experts on transport from the European Commission and European institutes, futurists, directors from industry, academics from the University of Cambridge and Imperial College and a team from BP, including BP’s Distinguished Advisor Downstream Technology, Mike Muskett, and Head of Emerging Technology, Dr Dan Walker. Several new insights were derived, including the potential shift of power from governments to companies and citizens and the increasing power that new entrant companies, such as Amazon and Uber, may have in future mobility services. The increasing importance of regulation that may include demand-side as well as supply-side controls. Gill Ringland described the workshop process in her blog. The IfM is a world centre of excellence for roadmapping. It has been researching the application of roadmapping for more than two decades and its techniques have helped more than 300 public and private sector organisations with their strategic and technology innovation planning.